PINGDINGSHAN, Henan - Forty-seven people are dead after an explosion at a coal mine early Monday in Henan province, the local government said. 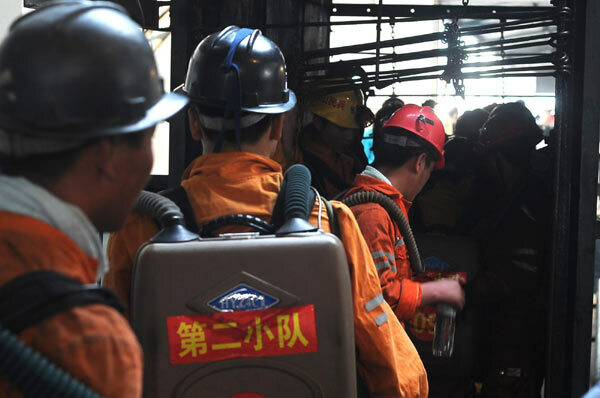 A total of 75 miners were trapped after explosives detonated in the powder magazine of the Xingdong No 2 Mine in Weidong district, Pingdingshan city, at about 1:40 am. The municipal government of Pingdingshan confirmed that 28 miners emerged from the mine alive, but the other 47 were killed. Many bodies of the victims have been lifted to the ground. Zhou Li, kneeling at the exit of the shaft, insisted on waiting for her husband Guo Xiujun. The young couple moved to Henan in February from the eastern province of Shandong to earn more money. "He is just 29. How can I and my son survive without him?" said Zhou, weeping. The privately-owned mine has an annual production capacity of 90,000 tons. Its mining license expired on June 6, but owner Liu Jianguo illegally resumed operations, according to an initial police investigation. Police have detained Liu at his work premises and the mine's bank account has been frozen. President Hu Jintao and Premier Wen Jiabao Monday ordered those who came to the rescue to use "every possible means" to save the miners right after the incident. Both Hu and Wen urged measures to prevent possible secondary disasters, and efforts to determine the cause of the explosion. Entrusted by the Central Committee of Communist Party of China and the State Council, State Councillor Ma Kai was heading to the site to visit the families of the dead and injured.